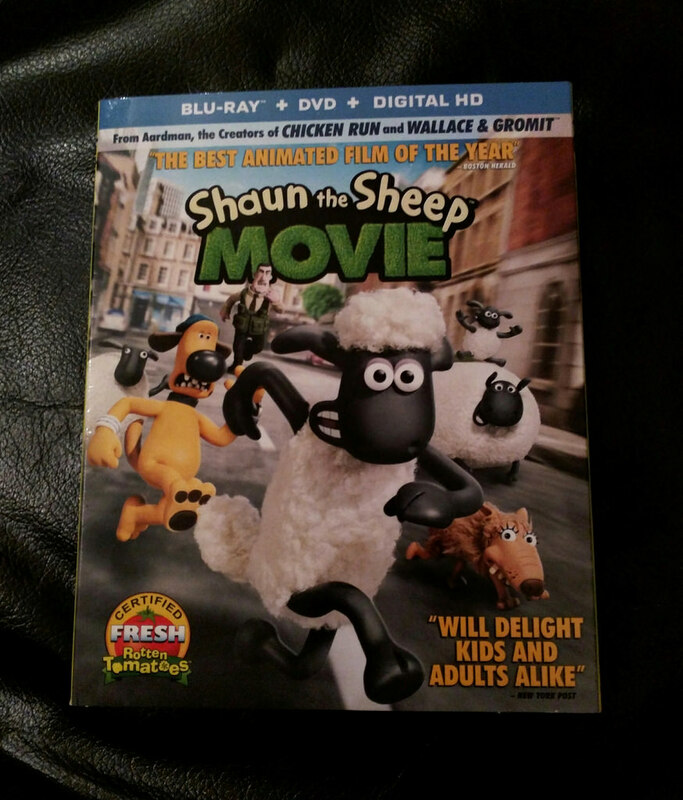 The United States got out dose of the Shaun the Sheep Movie a bit later than some other countries, with our theatrical release on August 5th and the DVD/Blu-ray release coming up this Tuesday, November 24th. Thanks to Lionsgate Home Entertainment, I was granted an early release copy of the [Blu-ray + DVD + Digital HD] edition that arrived last week and I took time to watch last night. If you weren’t fortunate enough to catch the film in the theater during the short time it was there here in the US, you’re in for a treat! The premise of the film is that Shaun and his fellow farm-dwelling sheep friends want to take a day off from the typical routine. After a series of calamities, this plan for a day off takes all of them, the Farmer and Bitzer the dog into The Big City where much of the movie takes place. 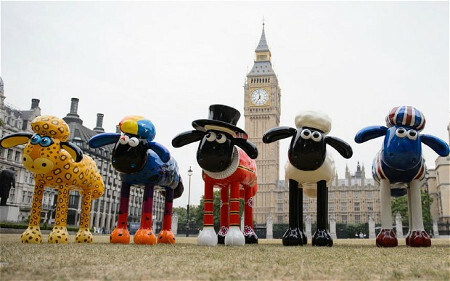 There, the sheep try to blend in with city life, while trying to avoid Trumper, a power mad Animal Containment Officer. The Farmer unintentionally tries his hand at a new career and it’s up to Shaun, Timmy and the rest of the sheep to make sure they all get home. The box reports an estimated running time of 85 minutes, and astoundingly the film moves along quickly and humorously with no dialogue. Sounds from the animals and people, plenty of the character expressions that Aardman is famous for to make the characters come to life, but aside from the amusing songs throughout the film, there are no real words in the film. It was quite an impressive feat, and as far as I know, a new one for one of Aardman’s big theatrical releases. Chicken Run and the Wallace & Gromit films all have dialogue. The box came with two disks, a DVD and a Blu-ray copy of the film, as well as a voucher with a code for the Digital HD Edition. Making the Shaun movie: This was a making of documentary about the film that lasts about 12 minutes, with comments from various members of the production team and even some words from Shaun (and Wallace and Gromit!) creator Nick Park himself. The making of takes you through script writing and story, model making, set building, animating, voice recording, music and reviewing the final cut. 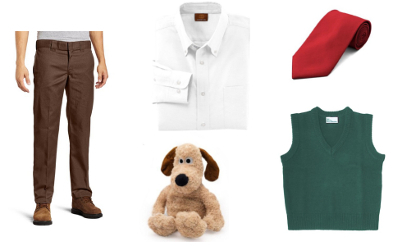 Meet the characters: In approximately 5 minutes, this segment introduces you to several characters in the film: Shaun, Slip, Timmy and Trumper. Join Shaun behind the scenes: In 3 minutes of original content (not lifted from earlier Making), you follow Shaun from how the claymation characters move to a quick explanation of how different models are built, learning how the humans and sheep characters are different. Meet the crew: If you saw the earlier Making short, you can likely skip this one, as the commentary from the crew is duplicated here. But you do get great perspective from the crew if you just want to watch this one on its own, or are looking for a quick behind the scenes refresher. Parody Poster Gallery: In this little feature, you can page through several parody movie posters based on other blockbusters that were in theaters around the same time as Shaun the Sheep. 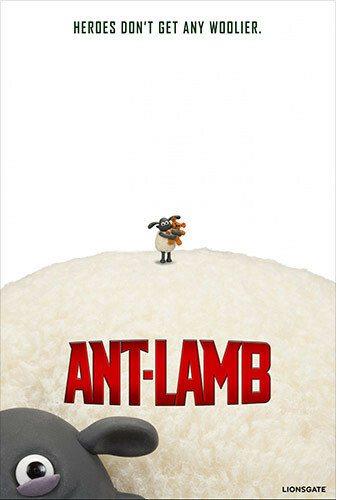 Enjoy little Timmy on the cover of Ant-lamb, the sheep crew as they star in Fantastic Flock or catch death-defying Shaun featured on the poster for Mutton Impossible: Rogue Bacon. While waiting for the Blu-ray to load up, I took the opportunity to pull out my Android tablet and download the Digital HD version from Vudu. 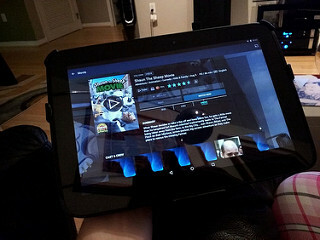 The process was straight forward, and by the time the Blu-ray menu popped up, I was on my way to downloading it to my tablet as well. It’s really great when the offer for a digital copy works so well. If you’re outside the US, you’ve probably had the opportunity to pick up the film already, but if you’re in the US your chance comes up this Tuesday, November 24th. You can likely pre-order it already from your favorite vendor, or hop out on Tuesday to pick it up directly. I highly recommend it, I’m sure I’ll be watching it again really soon. 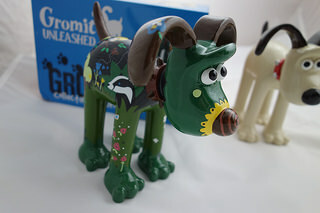 I plan on writing a more news-based post soon, but right now I wanted to pause to give a quick tour of some of the latest products made available by the Gromit Unleashed folks. I talked about placing my order in a post back in November and was pleased to later receive the order, fully intact here in California a few weeks later. While the shipping does almost make orders prohibitively expensive, it did save to order a few things at once. I’ll hold off on any Shaun in the City orders until selection increases and I can buy a few pieces. As I mentioned in that last post, I got the Creature Comforts Gromit Figurine and the Gromit Classic. They both came out beautifully. I also purchased a copy of Wallace and Gromit Monopoly. So much fun! 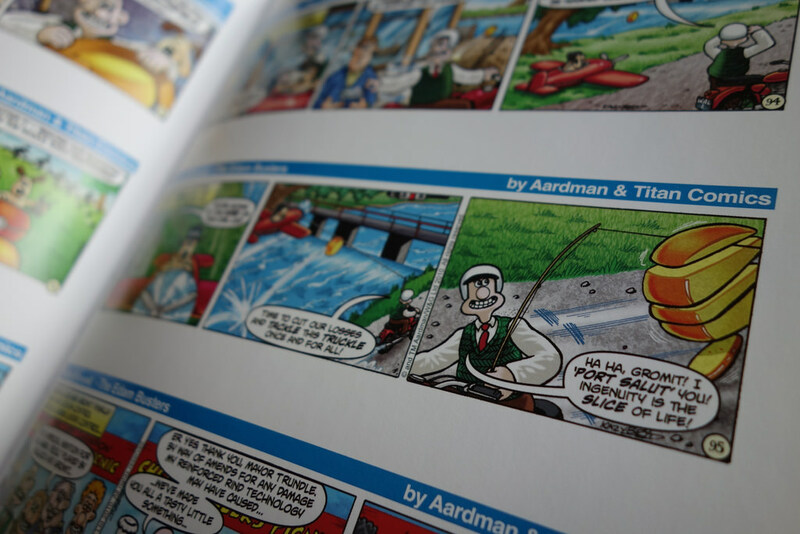 Beyond Gromit Unleashed, over the past 18 months we’ve also had the pleasure of seeing the Wallace and Gromit Comics by Titan be released in book form, so far with 3 volumes released. The first was released back in October 2013, second in November of 2014 and the third that I pre-ordered and had on my doorstep at the end of March. The books are wonderfully bound and the comics within are beautifully colored. The book is organized so that there are several pages of comics and then full color spreads of pictures from their various adventures, from movies to shorts, as seen here. The release in the US of these comics made me particularly happy, because aside from shipping and cost issues that I often run into, as far as I know it was the first time these comics are available in printed form (not digital) on this side of the ocean. I highly recommend picking up all three if you haven’t already, with a lean $16.99 price tag each you won’t regret it. They’re all available via Amazon and other major book sellers here in the US. Wow, it’s been a while! Lack of updates is completely on my end, with work and other responsibilities piling up on my end this year, finding time to update this site with Wallace and Gromit news has slipped through the cracks (note: if you’d like to help, please drop me a line: elizabeth@wallaceandgromit.net). The year has also been quite busy for Wallace and Gromit, so I’ve missed a lot! I shall now attempt to do a whirlwind tour of what the lads have been up to. 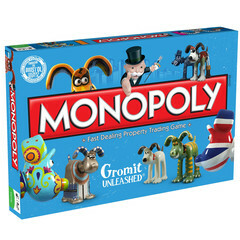 First up, exciting news today about the availability of Gromit Unleashed Monopoly. 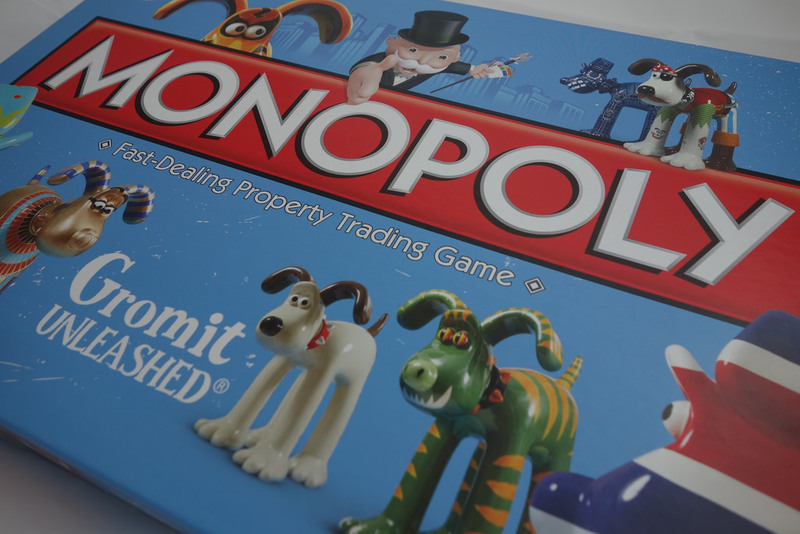 I’ve long resisted the branded Monopoly games, but in this case I gave in. The game costs £29.95 and shipping to the United States is expensive so I decided to also purchase a couple Gromit figurines as well (Classic and Creature Comforts). All told, shipping came out to a whopping £34.53, but I think it was worth it. It’s also worthy to note, that they support International orders through their system now, so there is no longer a need to email them directly. 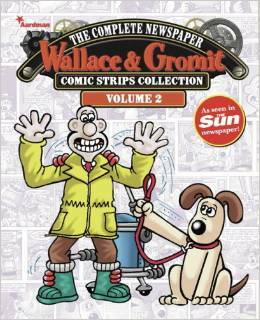 In more shopping news, I was delighted to learn earlier this year that Wallace and Gromit: The Complete Newspaper Comic Strip Collection Volume 1 was released, and doubly so that just last week (November 4th), Wallace and Gromit: The Complete Newspaper Comic Strip Collection Volume 2 came out! It’s on my way to my home as we speak. Check out a great review of Volume 1 by Victoria Irwin here: The Complete Newspaper Wallace & Gromit Comic Strips Collection. For the first time outside the UK, 70 Gromit Unleashed sculptures have come together to create a unique exhibition at ELEMENTS mall in Hong Kong, with each Gromit individually designed and decorated by an array of top designers, celebrities and international brands – including four designs from Aardman Animations! The Bristol Post wrote a couple articles about it:Gromit Unleashed launches in Hong Kong with a 4 metre tall Gromit and Gromit unleashed on Hong Kong for new exhibition. Also check out a video and some photos of the exhibition over on WallaceAndGromit.com: Gromit Unleashed Hits Hong Kong! I’ve also embedded the video in this post. The Bristol Post reports that the auction in Kowloon a total of £45,389 was raised. Over the summer, from from May 24 to September 7, Bristol was host to a Wallace and Gromit Exhibition at M Shed Museum. The exhibit featured concept sketches, models and actual sets from the films, some great photos from the exhibition were shared in this article from Bristol Culture: Wallace & Gromit exhibition at M Shed. And Tricia Orchard shared another series of photos here: Wallace and Gromit at The MShed. A post by The Guardian also gave some show highlights: Wallace and Gromit – a sneaky preview of the M Shed exhibition. Happy New Year, Wallace and Gromit fans! 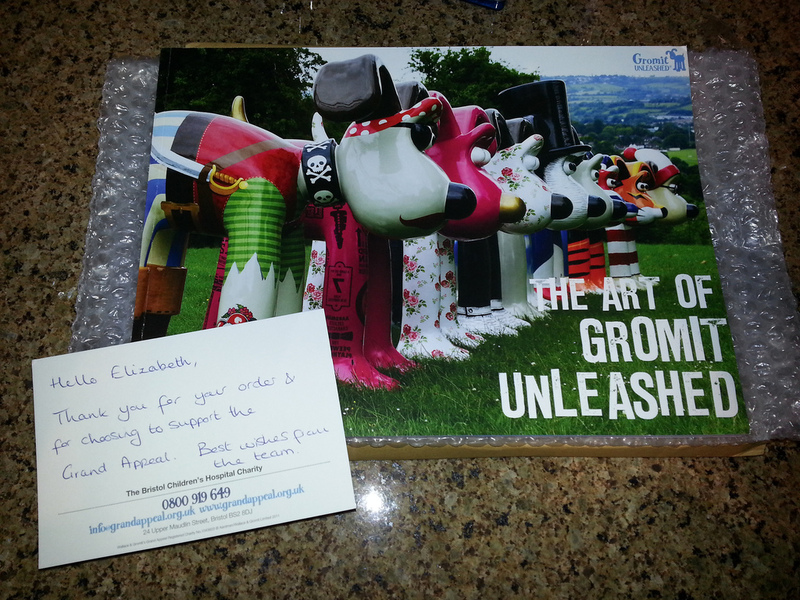 For the holidays this year, I ordered a copy of The Art of Gromit Unleashed, which wasn’t cheap when shipping to the US was added, but was worth it. Between the articles I’ve read on the Gromits and the background information about every Gromit provided in this book, I almost have stopped regretting not booking a trip over the Atlantic to Bristol to see them in person. Plus, the fine folks at The Grand Appeal included a hand written note with my purchase. In musical news, the duo just finished up their Musical Marvels events in London and Sydney. There are currently no upcoming shows but you can sign up for their newsletter to be notified of any updates. 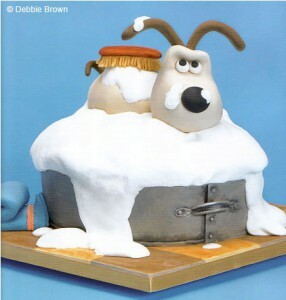 This fall through December 31st, Homepride Flour sponsored Wallace & Gromit’s BIG Bake which included a fundraising kit for individuals to bake goods and sell them for the Wallace and Gromit charity. The winner will be announced at 5pm on Monday 13th January 2014. Keep an eye on Wallace and Gromit’s Charity Pintrerest page for more. In the spirit of things, here is a sampling of what came out of that! 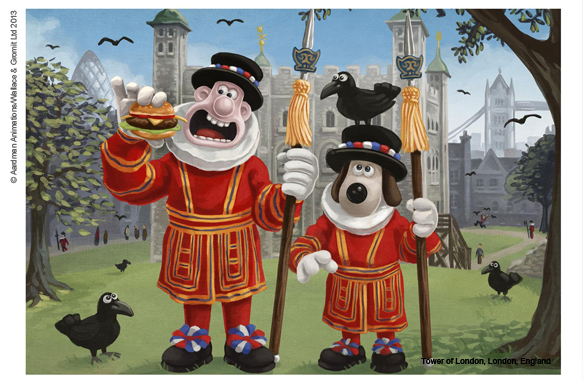 I have already written about some of the exciting things Wallace and Gromit were up to over the summer, but the biggest one of all was the Gromit Unleashed art display in Bristol, UK! For 10 weeks from the first of July Gromit statues decorated by world famous and local artists alike dotted the city of Bristol in a walking tour that attracted thousands. The exciting summer wrapped up with an auction of the statues in September that raised over £2.3 million for Wallace & Gromit’s Grand Appeal charity for children and their families Bristol Children’s Hospital. The unveiling of the statues themselves was seen over by none other than Wallace and Gromit Creator Nick Park! Throughout their display time the wait times to see the Gromits were tracked on the @GromitUnleashed twitter account and at times reached up to 3 hours! 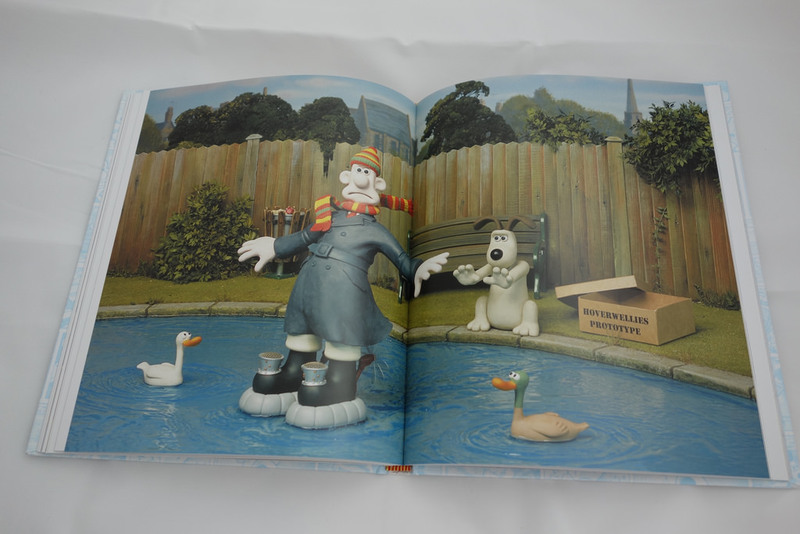 As a wrap up, the Bristol Post published a fantastic 32-page booklet titledThe Great Gromit Auction on ISSUU, so you can browse the whole thing online. Looking for more photos of the gromits? 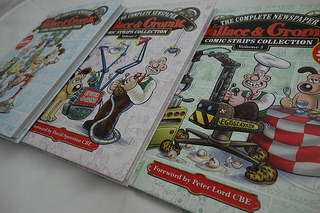 Be sure to visit the Gromit galleries on the Gromit Unleased website for more. There are figurines being produced of many of the gromits, which will be available on the Gromit Unleashed Shop. Unfortunately they are out of stock but have promised to fulfill demand next year. You can click on the “Newsletter” link on the website to be kept up to date with current developments, including when new figures will be available. And they don’t ship to the United States directly on their website, but I was able to follow the instructions to contact them and just sent in my payment for the The Art of Gromit Unleashed Book – a steep $41.46 including shipping to the US, but I’m sure it’ll be worth it. Hopefully I’ll be able to get one of the figures too when they’re available again. What a summer for Wallace and Gromit! 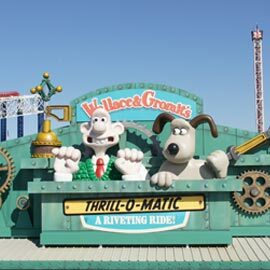 We saw the opening of the Wallace & Gromit Thrill-O-Matic at Blackpool Pleasure Beach. This is the first amusement park ride featuring the duo to be launched, so a very exciting moment! 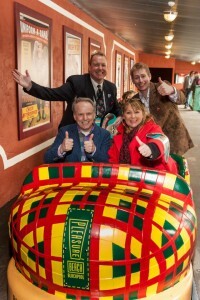 There was a lot of press coverage leading up to and around the opening in April, including lots of great photos with Nick Park as he was there to celebrate the opening of the ride. 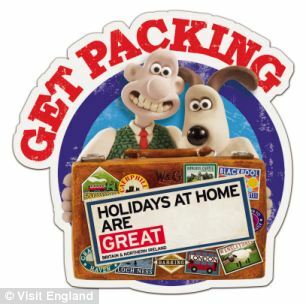 Then Wallace and Gromit hit the trail to team up with VisitEngland promote “staycations” in the UK. 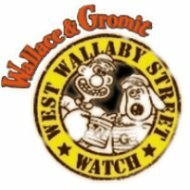 Announcement on WallaceAndGromit.com here: Wallace & Gromit’s Great UK Adventure Begins! For Shawn fans, we also saw this news: Shaun the Sheep Movie is Announced! And perhaps the biggest news of the summer? The amazing Gromit Unleased tour in Bristol where 80 Gromit statues decorated by 80 famous and local artists! But this requires a post of it’s own, coming soon. 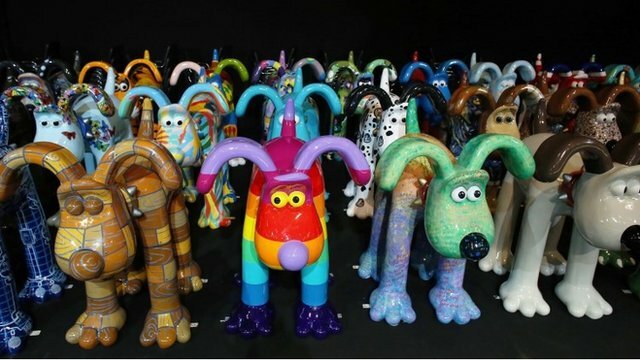 The Gromit Unleashed campaign features a series of 80 Gromit statues made by area artists that will be placed throughout Bristol for 10 weeks from July 1st to September 8th 2013. Thanks to Sarah Chidgey for letting me know about these videos! Posted in News by Elizabeth K. Joseph | Comments Off on Gromit Unleashed ads unleashed! It’s rare when my love for Wallace and Gromit intersects with my career in technology, but today was one of those days! 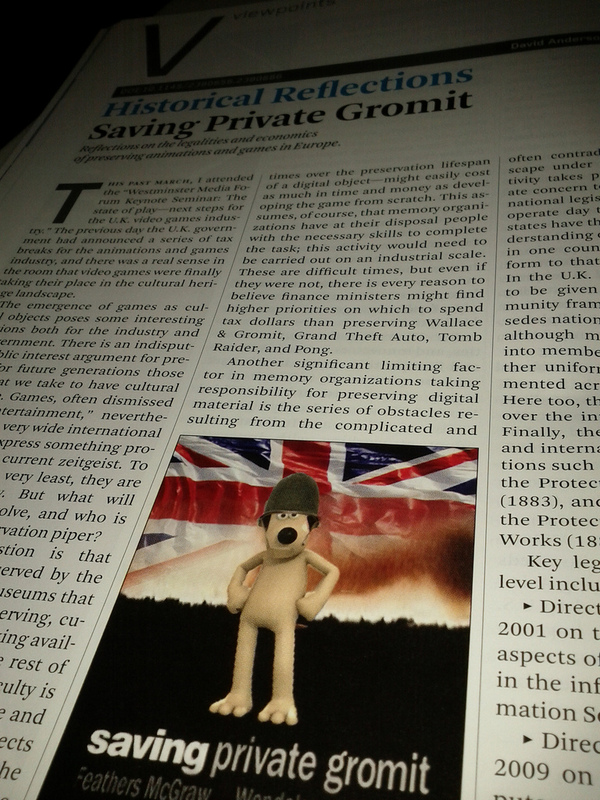 While reading an issue of Communications of the ACM this morning I found an article titled “Saving Private Gromit” (membership required to view, alas) about efforts to preserve and legal issues around preservation of video games, with a focus on the industry in the UK. Here’s hoping video games of our beloved duo can be preserved for future generations!